It’s been about two months since I converted my laptop to run Vista. ( See my April 5th post, https://arcanecode.wordpress.com/2007/04/05/ ). I thought I’d give you a quick update. So far, I’ve been quite pleased. All of my hardware worked right off the bat, and has continued to work without issues. The only thing I’ve really altered is Aero Glass. I finally turned it off, as several pieces of software didn’t seem to want to work to their fullest with Aero turned on. To be honest, I’ve found it’s not a big loss. My biggest adjustment has been learning to do things the “Vista” way. I’ve given up on fighting Microsoft, and am storing all of my documents, pictures, MP3s, podcasts, etc in the default Vista folders. I’ve also tried to use a lot of the provided tools, such as Media Player and the built in DVD burner. Some tools though I’m not giving up quite as easily, FireFox being the most notable example. I’ve left UAC (User Access Control) turned on. So far I haven’t found it to be that big of a deal. About the only time it gets annoying is when I launch Visual Studio. Everything else it’s seemed to figure out and quit asking. A trick I learned for my fellow laptop owners. Down in the status bar is the power icon. Hovering over it shows something called “Current power plan”. Well if you click on the icon, you are shown a menu. 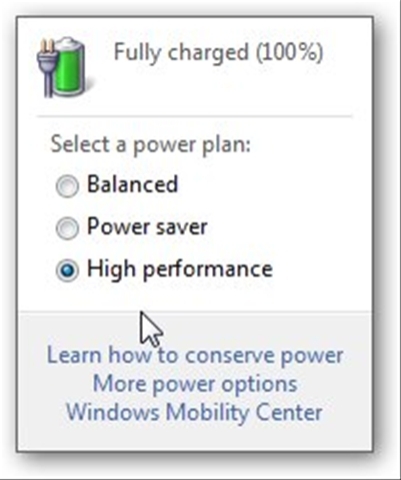 Probably 90% of the time I’m plugged in, so I run on high performance. For those times though when I am on battery, I find it helpful to switch to Power Saver. Your milage may vary, but I’ve been able to squeeze out over twenty extra minutes of run time by making the switch. Life with Vista. So far, it’s been a good life.